Trojan Supra Lubricated Condoms are ultra thin polyurethane condoms for ultimate sensual pleasure recommended for latex sensitive people. Trojan Brand Condoms Supra. contain no latex allergens and are designed to transmit natural body heat. They are ultra thin, yet strong and made from clear, odor free, medical-grade polyurethane. Ultra thin and strong. Compatible with both water-based and oil-based lubricants. No latex allergens. Medical-grade polyurethane. Clear and odor free. 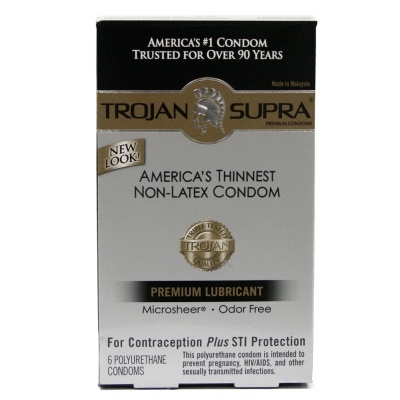 Trojan Supra Non-Latex Lubricated Condom 6 Pieces.